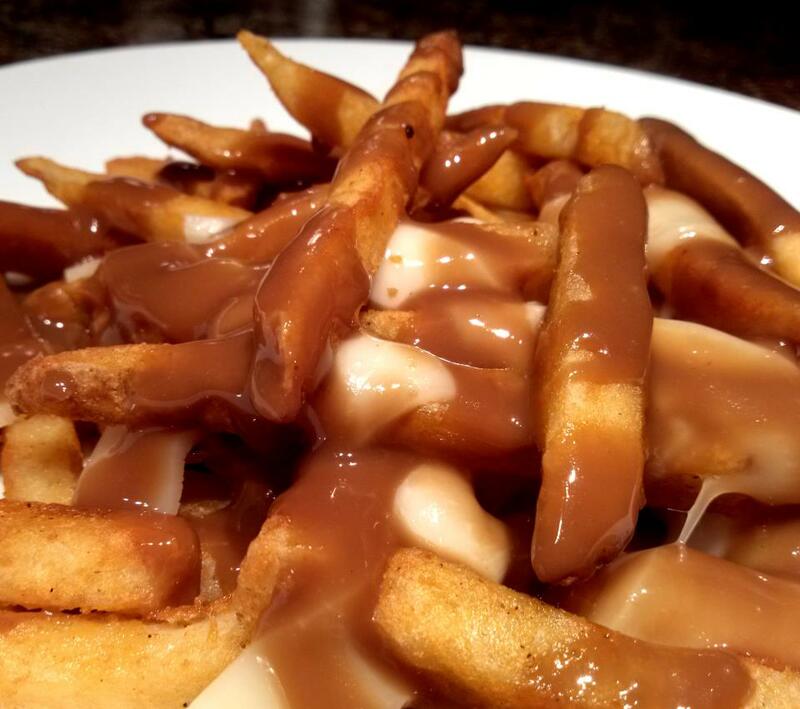 Quick and easy recipe for poutine, a Canadian combination of fries, cheese curds and hot brown gravy. That’s what I demanded of Husband the first time he mentioned poutine. Poutine is a Canadian dish made of hot fries topped with cheese curd and brown gravy. I’m from South-by-God-Carolina so I dang sure hadn't ever heard of it and thought he’d just called me something raunchy. But y’all. Y’all! How in the world has this dish not made it big time in the South? Fried potatoes, cheese and GRAVY? That’s got a Southern heart attack written all over it. You know we consider gravy a beverage down here. Every time we go up to visit his family we eat lots and lots and lots of poutine but sometimes he gets to jonesing for it in between visits so I've come up with a short-cut version that’s easy to make without too much fuss. Prepare fries to your liking and immediately season with salt. Meanwhile, add both packages of gravy mix to a small saucepan. Whisk in water and worcestershire sauce. Bring to a boil over medium-high heat while continually whisking. Once mixture reaches a boil, reduce heat to medium and simmer for 1-2 minutes or until thickened. Plate hot fries then top with cheese curds. Ladle gravy evenly over curds and fries and serve immediately. In Alabama, specifically in Chilton County, we have what we call "Hot Hamburgers" which is basically an open-faced hamburger topped with melted cheese and brown gravy (you can also have onions but I only do cheese & gravy) anyway, whenever I get I also get gravy & cheese on my tater tots or fries oh mah gah it's the best thing EVER. And now I'm craving it. I found a place that sells cheese curds at a little farm stand, Ashe County Cheese and it is the closet to Canadian Cheese curds so far. I have family send up Poutine gravy from Canada. My family is just like your husband when were in Canada we eat Poutine for lunch & dinner everyday were there. Can't get enough of this stuff.